Discover beautiful beautiful Southwest Florida - the Paradise Coast. Our Gulf Coast communities offer mile-long unspoiled beaches, world-class fishing and golf for beginners to pros. Use our tips for planning activities and excursions and to find points of interest. For the most up-to-date information, visit and like the Vesteva Facebook page or read our monthly newsletter with Southwest Florida Travel Tips! Click on the video to watch an amazing digital ecological calendar with stunning time-lapse photography that reminds of the many, year-round sights and migrations in Southwest Florida. Credit: The Beaches of Fort Myers & Sanibel. Florida is the strongest and most developed tourist state in the USA. Its appeal is due to its climate, the endless white sandy beaches and the many natural lakes. But other experiences are popular in Florida: Walt Disney World, the JF Kennedy Space Center and much more. The highest elevation in Florida is 300 feet. The coast, however, is infinitely long: 13,550 km, of which 4,880 km are on the Atlantic and 8670 km on the Gulf coast. In addition, there are 4500 islands, most of which are uninhabited and impassable. Cape Coral was established in 1958 by the Rosen brothers. In an area of about 116 square miles they dug more than 400 miles of fresh and saltwater canals - more than in any city on Earth, even Venice, Italy. 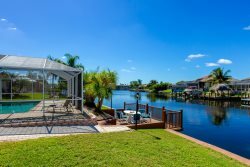 In Cape Coral, it is possible to reach Sanibel and Captiva Island from your backyard! All canals are man-made and some lead out to the Gulf of Mexico. Sun splashed days and balmy nights mean funtastic playtime fantasies come true in Cape Coral. Sandcastles, beaches, boats and bait fill leisure time in this coastal community that boasts more than 400 miles of canals, plus lakes and a mega river. The city has a water-filled treat of its own design. Sun Splash Family Waterpark offers more than two dozen wet and dry attractions on 15 tropical acres. Loll in a tube while gentle currents that take you on a sightseeing voyage around the park. Or grip the sides and grit your teeth wile you pitch and plummet in Cape Fear's 225-foot black tunnel. Prefer less orchestrated activities? Drift down to the Cape Coral Yacht and Racquet Club and let the kids frolic at the riverfront while you drop a line from the fishing pier. Fort Myers is know as the City of Palms and was made famous by Thomas Edison and Henry Ford. Impressed by the tropical climate and natural beauty, Edison spent his winters in Fort Myers as thousands of visitors do each season today. Fort Myers is located on the Caloosahatchee River and is the oldest city in Lee County. The historic downtown brings back the flavor of old Florida. This city offers an excellent range of shops, restaurants, bars, museums, theaters and cinemas, and many of these are to be found along US 41. The downtown area is the original part of the town. Close by, the Edison and Ford Winter Estates and many of the grand residences are located on the riverfront. It is also where some of the best restaurants and bars are to be found, and the drive down palm tree lined McGregor Blvd is unforgettable. Connected to the mainland by a four mile causeway some 20-30 minutes drive away is the unspoiled and upmarket atmosphere of these world famous Florida Gulf Coast vacation islands. Captiva is attached to Sanibel Island by a short bridge at Blind Pass and is in many ways even more paid-back and natural than Sanibel. We're showcasing all that Cape Coral, Florida, has to offer right here. Make this web site your springboard for jumping into the Southwest Florida cities and lifestyles that make up our paradise!